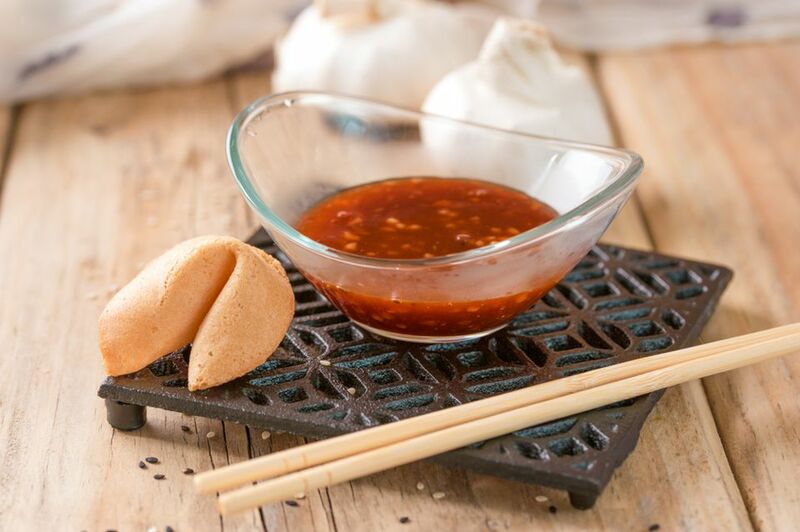 Chinese garlic sauce—similar to brown-sauce—it is quite popular in Western take-aways. In Chinese cooking, sometimes stir-fried dishes can generate some liquid during cooking and a lot of Chinese chefs will stir in some potato starch water. Potato starch water is usually 1-2 teaspoons of potato starch mixed with a couple tablespoons of cold water and this will “thicken” the sauce in the stir-fried dishes. Regardless though of the authenticity of garlic sauce in Chinese sauce, garlic is a great ingredient with multiple health—and taste—benefits. Garlic is closely related to onions, shallots, and leeks and has been used in both cuisines and for medicinal purposes from at least the Egyptian times. Garlic contains a compound called Allicin which is great for your digestive tract. Contains very little calories. 1 ounce of 28 grams of garlic contains 42 calories, 1.8 grams of protein and 9 grams of carbohydrates. It can help to cure colds and combat sickness. Can help to reduce blood pressure and cholesterol levels. Garlic also contains antioxidants that can help to prevent Alzheimer's disease and dementia. Research has been done to prove the exercise benefits of eating garlic. It has been proven to improve the performance of lab animals but tests in humans are so far inconclusive. Garlic is good for your bones, given its high manganese content. There is only one commonly used garlic type sauce in Chinese cooking which is used as a dumpling dipping sauce. Combine the rice vinegar, sugar, soy sauces, rice wine or sherry, chili sauce and sesame oil in a small bowl, stirring to combine. Heat 1 tablespoon oil over medium heat in a saucepan. Add the garlic and cook, stirring until aromatic (around 30 seconds). Quickly re-stir the sauce, add it to the saucepan and bring to a boil, stirring. (This will take about a minute). Re-stir the cornstarch-water mixture and add it to the sauce, stirring to thicken. Use in your favorite stir-fries and enjoy! With the exception of the rice wine or dry sherry, the seasonings for garlic sauce are available in the international food section of many local supermarkets.